McConaughey plays a drug using, homophobic, redneck rodeo cowboy who gets an unexpected H.I.V. diagnosis. He suddenly has to confront the fact that he has what he would describe as a "gay" mans disease. The social context is now on the other foot and in addition to figuring out how to fight against what at the time was a death sentence, he has to confront his friends who suddenly are not so friendly.The medical procedures at the start of any new crisis are uncertain and they may require sacrifices. The controversy over F.D.A. policies at the time reflects a bureaucratic mentality rather than a political one. While A.I.D.S. patients were understandably frustrated with the slow rate of reform and expediting the treatments for the disease, no one, including the doctors doing the research or the pharmaceutical companies, wanted anything more than to find a cure. Ron Woodroof was not the kind of guy who would wait around for others to figure it out. The physical transformation that the star goes through is frighteningly dangerous. Like DeNiro gaining a hundred pound to play Jake LaMotta, Matthew McConaughey loses weight like you can't believe. He looks sick before the story has even started. The fluctuations in his physical health are reflected not merely through make up and acting but by real physical change. This is the kind of stuff the critics groups and Academy will eat up. This is a much more flamboyant performance than his turn in "Mud", and it will probably be the one that gets the accolades. I prefer the more subtle work in the other film but that is just my preference. This is the story that will connect with the Hollywood community. Jared Leto gives a similar performance in the film as a drag queen facing the same kinds of issues that Ron has. Both roles take advantage of strong emotional elements in the story and they mirror each other in effective ways. The battle with the FDA and with an apparently unfeeling medical community is cleverly given a populist resolution by McConaughey's character taking advantage of loopholes in the law to be able to supply patients with medicine that might help them. Every opportunity he has to stick it to the man is cheered by the sympathetic audience. We all admire the perseverance of a man who is unwilling to go silently into the night. He demands the kind of help that everyone facing a terminal disease would hope to get. The fact that the disease is new, that the treatments are untested and that the rules require sacrifice is not something he will take laying down. This movie succeeds not only because the two leads are terrific actors in very cinematic roles, it is that they are empowering people to take control of their lives. There are great character actors in a variety of parts in the film. Michael O'Neil, who I will always think of as Ron Butterfield from "The West Wing", is the F.D.A. bureaucrat who needs to be taken down. Griffin Dunne was not recognizable at first as a defrocked physician, making a clinic in Mexico work for patients in need. The great Steve Zahn is a cop and friend to Ron, who knows exactly how far the law should be enforced. Jennifer Garner is not quite a love interest but is definitely a stand in for the audience in building sympathy for the two leads. Everybody does good work and the story plays out as expected but with very effective emotional touchstones despite the straight forward story arc. 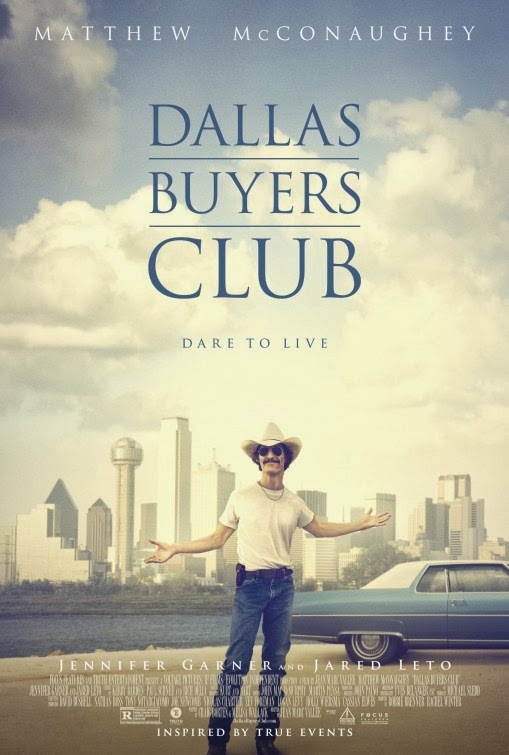 If you like good acting and a story of the little guy punching back at the powers that be, than "Dallas Buyers Club" is right up your alley.